In June of 2007, I reviewed Jennifer O'Connell's Everything I Needed to Know About Being a Girl I Learned from Judy Blume. Lizzie Skurnick's Shelf Discovery: The Teen Classics We Never Stopped Reading feels as if it was written as a companion piece, with a slightly different slant. While O'Connell's book included essays by twenty-two authors discussing the influence of Judy Blume's books on their works, this book discusses teen literature in depth, including many of Judy Blume's works. Both books have pictures of girls reading on the front, and Meg Cabot contributed to each. Laura Lippman introduces this work, mentioning a phrase that haunted her until she realized it came from a "Beany" Malone novel. She goes on to say Lizzie Skurnick wrote these essays as a regular feature, Fine Lines, for Jezebel.com. On a website for women, these essays about books read, and shared in memory, by so many, proved to be popular. I'm older than Skurnick and some of the other authors with essays here, Meg Cabot, Jennifer Weiner, and Lippman, but we still share many of the same titles. However, Skurnick read them in much greater depth than I did, and her analysis of these books, as they relate to a girl's life, is fascinating. The book begins with a girl's childhood, and moves through puberty, chapters on girls in danger, girls and survival, problem books, and teens dealing with the supernatural, before moving into adulthood. There are authors who dominate these books. Judy Blume's books are analyzed, from Are You There, God? It's Me, Margaret, to Deenie, then Forever and Wifey. Skurnick is fond of the heroines in Madeleine L'Engle's novels, and analyzes her feelings for those characters, Meg and Polly and Vicky. There's discussions of Lois Duncan, and her use of the same conceits over and over again. There are old-fashioned books, and romances. Skurnick's format is fun, and interesting. Longer pieces are called "Book Reports," and she analyzes a character and plot, and why she, and many girls, liked those books. Shorter pieces are called "Extra Credit." She's opinionated, and passionate about the books and their influence on her life. I love her enthusiasm for the stories, and the characters. And, she shows us what we've had in common as we grew up. As I said, I'm older than the authors, and many of these books came out in the years just after I was out of high school, when authors seemed to discover teens as readers. I was lucky enough to take Adolescent Lit in college and grad school, so I kept up with this reading. These aren't contemporary stories. These are books Skurnick calls "Teen Classics," so they're titles and authors we know - Duncan, Blume, Laura Ingalls Wilder, even Jean Auel and V.C. Andrews. Feeling a little nostalgic this time of year? Once you get through all of the family activities, you might want to try to find Skurnick's Shelf Discovery. I'm willing to bet that if you're reading this blog entry, as a youngster you were an avid reader, just as I was, and just as Skurnick was. And, I'm willing to bet that most women will find memories of some of their beloved books in these pages. 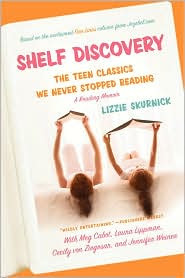 Shelf Discovery: The Teen Classics We Never Stopped Reading by Lizzie Skurnick. HarperCollins, ©2009. ISBN 9780061756351 (paperback), 448p.